Kyle Busch has accomplished a great deal in his career. 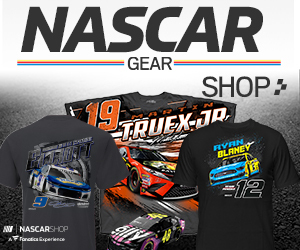 Sunday, he did something he has never done in the Monster Energy NASCAR Cup Series; with a dominating performance Busch won the Coca-Cola 600 at Charlotte Motor Speedway, becoming the first Cup driver to win a points paying race at every track on the circuit. 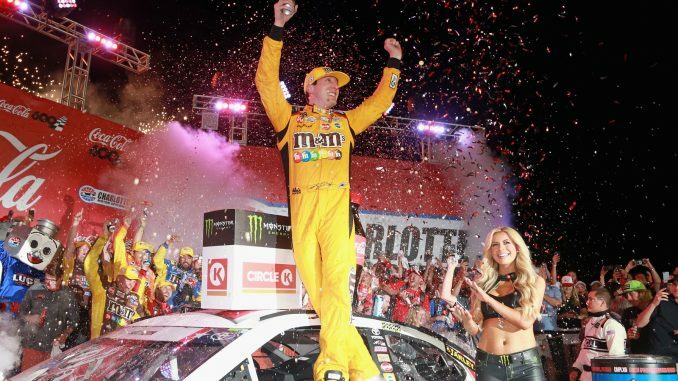 The M&M’s sponsored driver led 377 of the 400 laps in NASCAR’s longest race beating Martin Truex Jr. to the line by over three seconds and leaving only 9 cars on the lead lap. Busch led from pole and only dealt with three other leaders at various times for his fourth win of the season. His biggest contender this season, Kevin Harvick, who has five wins on the season had a tall mountain to climb even before the race started. Harvick failed pre-qualifying inspection on Thursday three times and failed to set a qualifying lap. He started Sunday’s race at the rear of the field but by lap 67 he was fifth. Harvick was looking for fourth when on lap 83 he lost a left front tire and slammed the outside wall in turn 3; Harvick’s day was done and he would finish 40th. The Team Penske drivers of Joey Logan and Brad Keselowski would lead laps as would Busch’s Joe Gibbs Racing teammate Denny Hamlin, but in the closing stages only Martin Truex Jr. seemed to have a shot at Busch. Truex rallied back from two pit road penalties, one for speeding and the second for an uncontrolled tire. He charged forward in the final laps and had second by lap 367. By then however, Busch had nearly a seven second lead; try as he might Truex could only manage to cut the lead to 3.8 seconds. Hamlin also overcame a pit road speeding penalty to finish third, Keselowski fourth and Jimmie Johnson scored a much-needed fifth place finish recovering from a spin after a meeting with Hamlin on lap 121. Nothing could hold back Busch has he became the first driver not only to win a Cup race at every track on the circuit, but the first driver to sweep all three stages. There were 11 cautions three for stages and 8 for incidents that included last year’s 600 winner Austin Dillon, Harvick, and a fiery crash involving Ryan Blaney who ran among the top five much of the race but lost an engine on lap 285. Blaney was able to escape unharmed. Jamie McMurray had several meetings with the wall but held onto finish sixth, Kyle Larson brought out the 10th caution when he spun on lap 277 but rallied to finish 7th’ Kurt Busch, Alex Bowman and Ricky Stenhouse Jr. rounded out the top 10. Busch keeps his points lead with a 67-point margin over Joey Logano who finished 22nd. The Cup series heads to Long Pond PA. for next Sunday’s Pocono 400 at Pocono Raceway. Live coverage will be on Fox Sports 1 with the green flag falling just after 2:00 p.m. ET.